"There's a lot of interest in natural fibers," said Gregory Ziegler, professor and director of graduate studies, Department of Food Science at Penn State. "Starch is one of the least expensive natural fibers out there. Nobody had been able to electrospin pure starch fibers before. But we figured out a way to do that using this wet electrospinning technique." 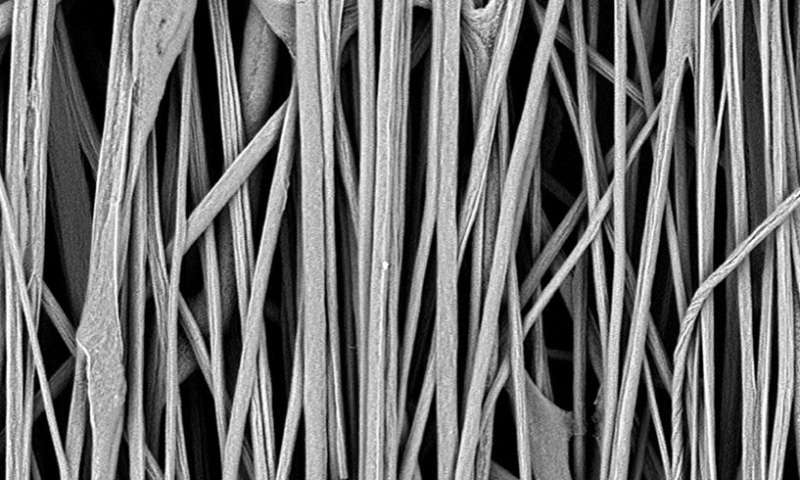 To produce fine starch fibers using electrospinning, electricity is applied to a starch solution as it dispenses from a nozzle. The electrical field that forms between the nozzle and a rotating collection drum draws the starch into long threads. In wet electrospinning, the drum is submerged in a bath of alcohol and water to help congeal the fibers. 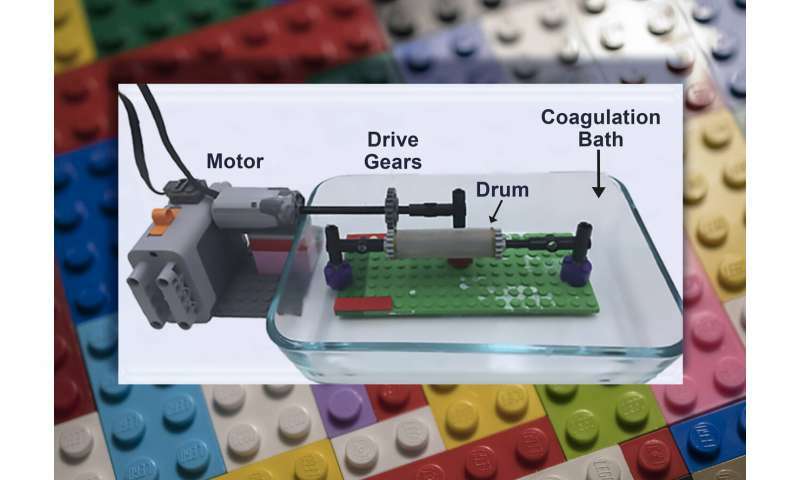 In a study recently published in Food Hydrocolloids, the researchers built an inexpensive electrospinning device partially using the popular children's toy Lego. "The reason we chose Lego is we're going to have water and ethanol in there and we don't want the device to be conductive," said Ziegler. "The plastic was perfect." By altering the drum rotation speed and the amount of ethanol in the electrospinning bath, the researchers optimized fiber alignment in the starch mats. They also found that mats with better aligned fibers were stronger than those with a crisscrossed array. Starch fiber mats have potential biomedical and food applications, including for lab-grown "cultured" meat. Cultured meat is reported to use less land, water and antibiotics to produce compared to traditional farming practices, and according to Ziegler, there is growing interest in such meat. To culture meat, animal muscle cells are cultivated in a nutrient-rich broth. If no structural support is provided, the cells grow without organization and resemble ground beef. It is more challenging to grow a steak-like product because the muscle cells must grow on a scaffold of appropriate size and alignment to form the characteristic texture consumers expect of a filet mignon or T-bone. Now, natural starch fiber mats could provide scaffolds for growing meat cells. "We've been able to align our scaffolding that could grow aligned muscle cells," said Ziegler. "A lot of scaffoldings that have been put out there for biomedical applications have synthetic plastic fibers. Who wants to eat plastic, right? Even if it's biodegradable, people don't want plastic in their meat. Here we have starch, and it just comes from corn. The idea is we could make a nice edible clean scaffold for our clean meat." Ziegler says the next step is to test if muscle cells will grow on the starch mats and whether they develop in alignment with the fibers. The researchers are exploring ways to make starch fibers in specific patterns using 3-D-printing technology. They also plan to scale up their equipment to produce larger quantities of the fibers. This paper was originally published in December 2018 ahead of print in the May 2019 issue of Food Hydrocolloids.